The above quote and the following text is from the rather lengthy introductory chapter to Ajahn Thiradhammo’s informative and practical book, Working With The Five Hindrances. If you read it and find it interesting you may wish to download the entire publication (freely available in several formats). The Hindrances can also be a great source of self-knowledge, of learning about the nature of self from which they originate. Human beings are prone to a great variety of mental defilements and afflictions. Gaining some understanding on how to work through these Hindrances will go a long way towards helping to work through the other obstructions as well. If we investigate these Hindrances down to their source in selfhood, we can discover the root cause of suffering which, once released, results in the liberation of awakening. The first hindrance is desire for sensual pleasure. It is that attitude of reaching out for sense stimulation: wanting, longing for, desiring it. It covers the whole range of sense impressions through eyes, ears, nose, tongue, body, and the mind as the sixth sense. These are the source of all our impressions of the world, and through them there is the possibility for desire, longing, wanting and attraction to arise. While these usually focus on pleasant experience, the hindrance can also apply to any type of experience for the sake of contacting sense impressions. The second hindrance is ill-will or any kind of pushing away of experience: resistance, irritation, aversion, etc. This is usually a response to unpleasant experience, but can also occur as a result of any sense impression, especially if it is unexpected, unknown or unwelcome. The third is usually translated as ‘sloth and torpor’, but is that really clear or maybe just Buddhist jargon? According to The Path of Purification… the first term means ‘lack of driving power’. Perhaps it is better to say ‘lethargy’, not having vigour or lacking energy. The term for ‘torpor’ means ‘unwieldiness’. This usually manifests as laziness or sleepiness, drowsiness, dullness of mind. Thus perhaps a clearer definition would be ‘lethargy and drowsiness’. The fifth hindrance is doubt, which can manifest in a variety of forms. It can be sceptical doubt, uncertainty, perplexity, specifically with regard to the teachings or the training, or even self-doubt about one’s ability to do the practice: ‘What is the purpose of this? Can I do this? Is it going to be useful? Will it work?’ It can also be a state of confusion, worry or indecision. It causes wavering and vacillation, and at the extreme it paralyzes us, preventing us from initiating any activity. Some people might like to add a sixth hindrance. Something which can hinder many people from developing meditation is fear or anxiety. However, I would put fear under the hindrance of doubt, since we usually fear what we do not know. Once we know what we fear, even when we just know fear itself, there is the possibility that it can be resolved. Some people might put fear under the ill-will hindrance, but my experience is that ill-will or aversion is usually a reaction to fear rather than its cause. Of course, one could also fear one’s aversion. So why did the Buddha highlight these five in particular? Well, in practical terms, five is a reasonably manageable number of concepts. When you are in the forest meditating and you don’t have a book (or the book’s been eaten by termites), you can probably remember these five categories, maybe by looking at the fingers of your hand and going through the list. Also, this group of five encompasses most of the range of disturbances we may come across in spiritual practice, especially if we generalize them in terms of basic human tendencies or how we usually relate to experience. Maybe we sometimes have to deal with different kinds of specific disturbances, but basically we can probably fit most of our experience of disturbances into these five Hindrances if we look at the energy dynamic of each of them: reaching out, pushing away, collapse, over-activation and vacillation. For example, if we are disturbed by envy or jealousy, we can assess its energy dynamic (a kind of pushing away) to find an associated hindrance (ill-will) and gain some understanding of how to work with it. Similarly if the disturbances are of a general nature, distractedness, discouragement, etc., and there is no obvious cause (distracted by sensual desires, discouraged because we lost our temper), we can access their energy dynamic and may find it helpful to apply some of the skilful means of the closest equivalent hindrance. Of course, each specific mental obstruction and each particular nuance of a hindrance will need to be worked on with its own unique means. However, when we have experience of working skilfully with the coarser Hindrances, it is possible to apply this wisdom to help with working on more subtle aspects of mind. The development of the Four Attendings with Mindfulness follows a progression. First there is awareness of body, then of feelings, then of conditions of mind. Through this progression we develop an increasing strength and subtlety of awareness. Bodily sensations are fairly tangible, the three feeling tones are reasonably discernible, and then sixteen conditions of mind are specifically mentioned. In general, then, it requires a significant increase in awareness to have clarity with regard to the great diversity of conditions of mind, not to mention their fluidity and rapidity of change. Then we come to the fourth theme of the Attendings with Mindfulness: development of awareness of specific phenomena ( dhamma ), under five categories, one of which is the Five Hindrances. This comes at an advanced stage in the progression of developing mindfulness. If your mind is obsessed with desire or ill will, or overcome with sleepiness, restlessness or doubt, it’s hard to be clearly aware of these phenomena. That’s why it’s important to have a very good foundation in mindfulness by first developing awareness of body, feelings and conditions of mind. Ideally you will then be able to get a clearer perspective on the Hindrances. Trying to be aware of them at the very beginning of practice, it is easy to be pulled into them or caught in doubt about them: ‘What am I actually looking at?’ However, if you have a very good grounding in awareness of the body, you can always relate back to it, or cross-reference it: ‘What is the condition of the body? Is it lacking in energy? Or has it got too much energy?’ Through the body you are able to recognize: ‘Oh, there is lethargy’, or ‘there is restlessness’. Thus you can generate greater awareness of the Hindrances through awareness of their expression in the condition of the body. Of course, developing mindfulness in a systematic progression is the general ideal. However, in real life we are usually assailed by the Hindrances in a variety of forms and intensities during the process of developing mindfulness and concentration. This is mostly in their undifferentiated form, as wandering, distracting, disturbing thoughts, memories or fantasies. Initially we then try to sustain some continuity of focused attention and awareness of the meditation object, for example, mindfulness of the breath, as the principal intention. If some of the Hindrances do seriously distract us from the meditation object, perhaps some of the exercises described in the following pages may be helpful for reducing their impact. However, it is generally difficult to engage in an objective and thorough investigation of them until some degree of concentrated collectedness and mindful clarity has been established. In the development of mindfulness we are instructed to be aware of the Hindrances in four modes: knowing them, knowing how they arise, knowing how they cease and knowing what prevents their arising in future. The first level of development is to be aware of them. Can you be aware of the distractions of mind which take you away from the breathing? Does the mind just fall flat? You take up the breathing and then you drift off it. Or you are pulled away by a desiring thought, or there is some ill-will or aversion: ‘I said that to somebody and they said that to me’; now it’s rebounding through your mind. Maybe ‘righteous anger’ arises and an old story starts up again. One of the hardest situations, of course, is when the mind is dull and sleepy. Then it is hard to see through the sleepiness. You are in the cloud already; how do you see the cloud when you are in it? Being able to clearly observe the many different distractions which take us away from the breathing already requires a certain degree of mindfulness. The second level of development is to observe what causes the Hindrances to arise, what initiates them, what are the conditions behind them. This requires us to be able to recognize the Hindrances, and have some degree of mental calm and non-reactive awareness in order to investigate them. The Hindrances have different nuances and degrees of intensity. For example, I can observe a dozen different kinds of sleepiness, there’s not just one. However, in the beginning we try to gather them together into general categories under one heading to observe where they come from, what initiates or causes them to arise. My experience is that being aware of a phenomenon helps to objectify it, though there are still subtle levels of subjective reference: ‘This is my state of mind, this arises from me, this is my hindrance’, etc. Whereas observing the cause of this phenomenon enables a significant opening up to impersonality, as we become more aware of the non-personal conditioning factors operating in the background, even without ‘my’ personal approval. It was the Buddha’s insight into the causally-conditioned nature of reality which was the key element in his awakening. The third level is to know what causes the Hindrances to cease. Once they’ve arisen, what leads to their cessation, how are we free of them? Sometimes you can be sitting in a drowsy state, but then it just fades away. Well how did that happen? Maybe that cup of coffee just kicked in. But maybe you did something in particular which caused the drowsiness to clear. What were you just thinking? Maybe some inspiring thought arose in your mind and cleared the sleepiness or dullness out of it. Inspiration can do that. But maybe that doesn’t work all the time. Maybe it just works for some kinds of sleepiness or dullness of the mind, but not others. The fourth level of development is how the Hindrances are prevented from arising in the future. Of course, this will require more than just mindfully observing. 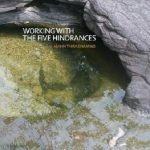 We gain some experiential understanding through knowing the nature of the Hindrances, from knowing how they arise and cease, and then we work through them using some of the methods outlined in this book. And this will very likely require some significant change in our behaviour and understanding of our self, before we are able to experience total freedom from the Hindrances. There are three basic ways to deal with the Hindrances. The first one, which is usually the familiar one for most people, is to try to get rid of them. Who wants a hindrance anyway? We want to be free of them, right. The second way to deal with them is temporary suppression, either unskilfully through repression or skilfully through developing states of deep concentration. This, however, is only a temporary respite. When the Hindrances subside the mind is in a very bright, concentrated and energized state, but when you eventually come out of concentration they are still there. They haven’t gone, they’ve just been temporarily taking a holiday. It’s like your troublesome neighbour going away for some time, but then returning home again. The third way is to clearly and wisely acknowledge the Hindrances as impermanent, causally-conditioned phenomena. We then investigate to remove the initiating causes and the Hindrances cease. In this way they are finally resolved. In essence they are aspects of our selfhood created by ignorance and grasping. Our investigation reveals the nature of selfhood and the processes creating selfhood. We can then release, relinquish, let go of these processes and are finally liberated from the entanglements of selfhood. The theme of this book is working skilfully with the Hindrances for final liberation. It is not about simply getting rid of them or only temporarily suppressing them, but about working with them in order to realize the truth of what self is and freedom from self is. Most of us probably still have conditioned into our minds (I still have it in the back of my mind, too) that working with the Hindrances is just another means of getting rid of them. That’s due to the pervasive activity of selfhood. Basically, if you are trying to get rid of the Hindrances, don’t bother. It not only makes the practice a lot more complicated by distorting the basic Hindrances, but it can be detrimental in the long term. In our eagerness to get rid of the Hindrances we usually succumb to suppression or avoidance strategies, further compounding grasping and ignorance. One of the most insidious strategies is ‘spiritual bypassing’, where for the sake of spiritual progress we bypass painful issues, often through the use of spiritual practices. However, since the Hindrances are not completely resolved, just temporarily out of awareness, they will eventually return, usually in some disguised form, for example, as psychosomatic symptoms. The Hindrances are different aspects of our self-identity. They are five symptoms of grasping at aspects of selfhood, conditioned by ignorance and craving. Or, speaking simply, they are five ways in which our self expresses itself negatively; it also expresses itself by their opposites, that is, through generosity, loving-kindness, energy, tranquillity and confidence. However, unless actively identified with, these positive self-expressions tend to reduce grasping of selfhood; they are actions of selflessness. The negative ones, since we are usually reluctant to recognize them, lurk insidiously in the background, quietly sustaining selfhood. People’s tendencies are such that they may have a very strong sense of self-expression in desire realms, or in aversion realms, or in dullness, or whatever. So if we are able to bring clarity and awareness to these expressions of the self, we learn some valuable and even profound things about our self, about the nature of grasping, ignorance and craving, and the process of identification. If you like, we are now transforming these so-called Hindrances into the wisdom of knowing how self is constituted and, in the process, what is beyond self. At the ultimate level there is no permanent self which has Hindrances to be got rid of; there are only self-supporting processes which we grasp and identify as being ours. So trying to destroy certain aspects of self-identity just results in subverting them into other aspects of self-identity, because grasping at an illusory self is still functioning. For example, if you try to get rid of your desires you become a control freak. You try to get rid of aversion and you become depressed. You struggle to get rid of lethargy and drowsiness, and you’re despairingly exhausted – the mind was already lacking energy and trying to fight your way through it exhausts you further. You try to get rid of restlessness and you have anxiety attacks. You try to get rid of your doubt and become a raging fundamentalist. However, if we can skilfully engage and work wisely with the Hindrances they can be transformed into increasing self awareness, self knowledge and self liberation. For example, the hindrance of doubt can be transformed into reflective thought. Rather than just doubting everything, you can investigate these doubts to determine what is worth considering and what is not. At its extreme doubt can just paralyze you, but if you can engage skilfully with doubt it can become enquiry: ‘What’s going on here? Who is doubting anyway?’ Then there’s an opening for investigating and finding out what’s really going on. Likewise with all the other Hindrances; when they can be transformed with wisdom, they are actually reconstituted as valuable spiritual qualities. Of course, in the process we also relinquish those aspects of selfhood which nurture the Hindrances. What aspect of selfhood are we grasping which results in this form of hindrance? For example, if you keep having anger arising from a feeling that you have been wronged by someone, maybe you need to surrender the conceit that ‘I’ have been wronged. Right and wrong are sometimes quite subjective, which ‘I’ is still grasping the thought of being wronged? Until we are awakened we are still functioning from the realm of the ego. The precious ego really wants to get rid of all these nasty things. It’s humiliating for your ego to accept: ‘I’ve got Hindrances’, whereas it’s a real pat on the back for it to say: ‘I haven’t got any Hindrances, I just chased them all out.’ The ego wants to triumph over them and come out the better for it. But ultimately that’s never going to work, since it is still playing ego’s game. Unfortunately, however, it can seem to be working. You chase out your aversion, but you end up with depression. In fact you are probably depressed about your aversion, which has just gone underground; as the saying goes: ‘Sad is mad’. So it seems as if you don’t have any aversion anymore, and perhaps depression is more socially acceptable these days than aversion, anger and aggression. But it’s not going to work in the long term, it’s still aversion incognito and has not been fully resolved. We have to be very vigilant and reflective, because that sense of self goes on functioning in the background with its dominant attitude of conquering the Hindrances and coming out on top as a bigger and better self. It takes some degree of openness, stability and clarity of mind to be able to see the Hindrances clearly, because our self has identified with them as being ourself, our point of reference, our stable, familiar self: ‘These are my desires and my aversion, and the rest of these things.’ That’s just how the self has formed itself, that’s how self-identity is created in the first place, and these Hindrances reveal what is being grasped at to keep nourishing that self-identity. When we are able to get some perspective on the various Hindrances, we have the possibility to go through and beyond them. In a sense they are still there in a certain form, but our relationship to them changes. For example, by being aware of sensual desire and understanding its effects, we are less likely to give energy to it and it stops feeding certain aspects of our old selfhood. Knowing that sensual desire is an expression of selfhood, its view of reality, its particular form of ‘thirst’, its way of grasping, etc., allows a more open ‘enquiring space’, suitable for insight to arise in its place. Another benefit of investigating the Hindrances is that we begin to see these aspects of our being more as flowing, impersonally-conditioned forces and less as static objects. The word ‘hindrance’ denotes ‘thingness’. It seems I can take that ‘thing’ out of my mind: ‘I’ll take sensual desire out of this part, aversion out of that part.’ This is usually how we relate to things. However, when we become more aware of the Hindrances as personal experiences, we come to see them as energies, as attitudes, as forces within us. So to be able to work with them skilfully we need to be a lot more flexible in our approach. A good example is becoming more aware of sensual desire. The word ‘desire’ already implies a certain amount of energy. Desire equals energy. However, most people focus on the object of desire, the something it is fixed on: ‘I desire that thing’. Then things change and desire looks around for something else to latch on to. Watch out — desire is on the loose! However, when you can tune into that desire energy, you can transform it into something more skilful. It can be turned into a more positive energy, possibly into right energy, right effort or desire for spiritual practice (dhammachanda). When we become more open to the Hindrances at the energy level, we begin to see them quite differently. They become more fluid, open forces and energies, which can be transformed. What before were Hindrances, something to be concerned or disturbed about, are now fertilizer for wisdom. The way to awakening is through the Hindrances, not by fighting against them. We are awakened to them as they really are, rather than seeing them as the self would have us believe. That’s what awakening to the real truth of reality is – seeing things as they really are, free from self’s delusions. So at a certain stage in the development of meditation on the breathing we turn the meditation practice around and become more aware of what the distractions are. Can you watch your mind when it’s not on the breathing? We all want to watch when the mind is peacefully on the breathing. But can you also be aware when it’s wandered off the breath, aware of where it goes and what else it engages with? That usually requires a lot more flexibility and greater development of awareness. Once developed, awareness can then penetrate into the underlying structures of the various distracting Hindrances. What is their source? What causes them to disappear? And how do we have to change our attitude, change our way of relating to reality, so they aren’t going to come up again, so they will no longer keep sustaining this sense of self in those particular negative, distracting ways? If we can be free of that hindered self-identity, awakening is there. It’s not a matter of ‘getting’ awakening; it’s a matter of clearing out the debris to allow awakening to manifest of its own accord. The most obvious expressions of selfhood are through sensual desire, ill-will, lethargy, restlessness and doubt, so this is where we can discover its secrets and uproot its strategies. Thus what before were called Hindrances are really precious jewels when transformed into a source of wisdom. They are a basis for knowing the nature and expressions of selfhood. This is the most valuable knowledge we can have, and one which can lead to ultimate liberation from the tyranny of selfhood and its troublesome Hindrances. It is unfortunate that sometimes when we hear about our gross defilements of greed, aversion and delusion, they can seem so overwhelming and/or abstract that all we can do is yawn, smile knowingly and get on with life as usual. However, when we are serious about spiritual development, and especially in the practical exercises of developing mental calm and clarity, we come face to face with these direct and obvious expressions of selfhood in all their coarseness, rawness and discomfort – the true fertilizer for liberating wisdom. Here the Buddha has given us a most inspiring context for spiritual practice. In one of his teachings he said: ‘Brightly shining, luminous is this mind and it is freed of stains which visit.’ (A.I,10) That is, even though we usually give special attention to the mental obstructions, Hindrances and defilements, these are not the true nature of mind. Its true nature is radiance. Once we have had some experience of working with the Hindrances using the basic methods and techniques, there are occasions when we have to be creative in our own particular way with our own individual form of Hindrances. As Ajahn Tong Rat, one of Ajahn Chah’s teachers, is quoted as saying: ‘If defilements come too low, jump; if they come too high, duck.’ The teachers in the Thai Forest Tradition often mention using ‘skilful means’ ( upāya; Thai: ooby ) in the development of meditation. With regard to ‘skilful means’, Ajahn Chah’s guidance was: ‘If it works, use it’. This of course implies our actively testing out whether something really does work or not. And sometimes a skilful method may only work for a limited time, since the ego is very clever at appropriating everything for its own self-preserving agenda. So we have to keep one step ahead of it, continually pulling out the rug from under its attempts to appropriate any skilful means which may threaten its existence. The Buddha has given us many profound and beneficial tools for working with the mind and all its activities, but sometimes we have to ‘personalize’ them or adapt them to our own unique mental environment. While, generally speaking, all human beings have similar minds and mental states, at the more subtle level we are all quite unique mental configurations. We are the only ones who can truly know our own mind, so we are the only ones who can truly know how to work with it. While making use of the rich heritage of skilful means from the Buddha and other teachers, as well as our own specialized ones, it is most important to keep in mind not to use them as simply an antidote to the Hindrances. The real point of spiritual practice is to release the grasping at selfhood which the Hindrances express, not to simply counteract them. Certainly some reduction in their effect may be necessary initially, in order to experience a level of calm and clarity which is able to investigate them with some thoroughness. However, the Hindrances are symptoms of grasping, ignorance and craving, and this requires the holistic medicine of wisdom and relinquishment, rather than merely temporary relief of the symptoms. Skilful means are for the benefit of investigating the Hindrances in order to completely know them, what causes them, how they cease and how they are totally resolved. The only true antidote is awakening to the ultimate nature of reality as it truly is. Once we have some knowledge about the Hindrances and have established some degree of collectedness and mindfulness, it is important to try to be more aware of them as they are happening. Maybe we aren’t bothered much by them when we sit in the more controlled environment of meditation, especially if we are good at the technique of keeping the attention on the meditation object. But it can be helpful to take this theme into your everyday life and see what your hindrance of the week is. Here’s a little bit of homework: see if you can observe what particular hindrance(s) arise(s) in the course of the day and trip(s) you up. This can become a highly relevant source of investigation or study. These things not only cause a lack of awakening, but also obstruct a peaceful, happy life, so the sooner we can learn to free ourselves from their disturbing influence, the more smoothly our life will flow, and the more quickly awakening will happen. A meditation teacher in Switzerland often led a very popular form of retreat in various cities. It began with a weekend session and continued as an everyday life retreat, with people going to work during the day and gathering for a session in the evenings. Often it was based upon a particular theme, such as right speech or continuity of mindfulness throughout the day. Many people found this form of retreat very helpful, and some of them had some very important insights. Although most people had already done a number of formal retreats, this was something quite different, bringing more collectedness and clarity to their everyday life situation. Everyday life is where we usually have to deal with things as they really happen, and that’s where we spend most of our time. You can only be on retreat for so many days in the year; the other 350 or so days you are back in ordinary life. So to bring some more collectedness and clarity to the ordinary areas of our life is much more useful in the long term. So hopefully you can do your homework and try to recognize these Hindrances in the course of ordinary life. This will have practical relevance rather than being just an exercise in intellectual enquiry. 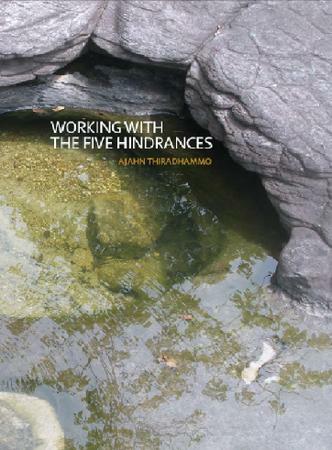 Excerpt from Working with the Five Hindrances by Ajahn Thiradhammo, pp. 17-35. Published by: Aruno Publications, Aruna Ratanagiri Buddhist Monastery, 2 Harnham Hall Cottages, Belsay, Northumberland, NE20 0HF, UK. This entry was posted in Commentary and tagged awareness, hindrances, meditation, mindfulness. Bookmark the permalink. Does Buddhism Have A Future?